It’s time to celebrate the fruits of the vine in Arkansas’ wine country. With the arrival of September, the locally grown grapes are ready for picking. And, as always, the wines and juices are ready for tasting. Since the late 1800s, Arkansas has been producing wine, making it the oldest wine- and grape juice-producing state in the South, according to the Arkansas Department of Parks and Tourism. In fact, Arkansas’ grape and wine production businesses are significant parts of the state’s tourism and agriculture industries, prompting the state to promote them to tourists as the Arkansas Wine Trail. Here’s a sampling of the trail’s offerings. 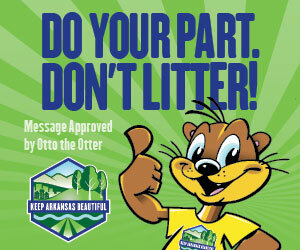 The heart of the trail, and of Arkansas’ wine industry, is the Altus area. It was here that Jacob Post immigrated to America from Germany in 1872. By 1880, he had planted seven acres of grapes to make wine that he sold to passengers on the Iron Mountain Railroad. Johann Wiederkehr, a Swiss immigrant, was drawn to the area in 1880, where he also began producing wines. Post and Wiederkehr selected the region for their businesses because the conditions reminded them of the rich winemaking regions of Germany and Switzerland. Post Familie Vineyards, located at 1700 St. Mary’s Mountain Road, is now a sixth-generation operation. If you’re looking for variety, this is the place because there are roughly 30 choices on the menu. You’ll find dry whites, rosés and reds, and many on the sweeter side such as Moscatos, Concord, muscadine and white zinfandel. 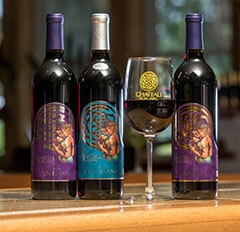 Wine made with the official grape of Arkansas, the Cynthiana, is also a mainstay of Post wines. Tyler Buelow, vineyard manager; Matthew Callahan and Gary McGuire trim vines at Post Familie Vineyards. Tina Post carries on the family’s winemaking tradition. “Our wines are fruit forward,” says Tina Post, retail sales manager. A tour is a must as you will meander through the modern bottling line and the warehouse. You’ll hear the story of the great-grandmother, Katherine Post, who was sent to prison for making wine during Prohibition and then marvel at 12,000-gallon tanks that house the product today. If you have a group coming through or want a more in-depth tour, schedule an appointment, says Tina. 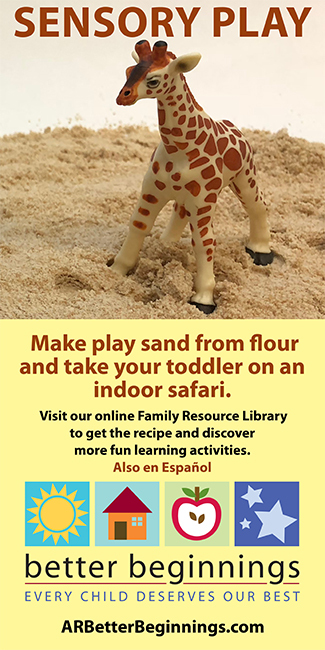 You’ll want to make sure to stop in the gift shop as well. 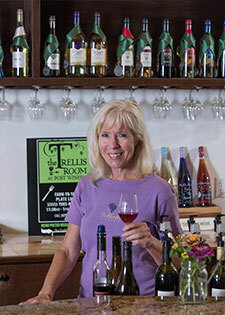 The winery also has a farm-to-table restaurant — The Trellis Room. 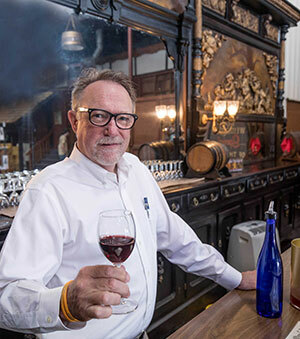 Dennis Wiederkehr, president and chairman of the board of Wiederkehr Wine Cellars, welcomes visitors to the tasting room with its Italian mahogany bar dating from the 1800s. The other pillar of Arkansas wine country is Wiederkehr Wine Cellars in Wiederkehr Village, just a short drive from Altus. This Swiss Alpine-inspired winery has a recently updated tasting room with a huge Italian mahogany tasting bar from the 1800s. Here you can enjoy a free tasting or take a free tour. 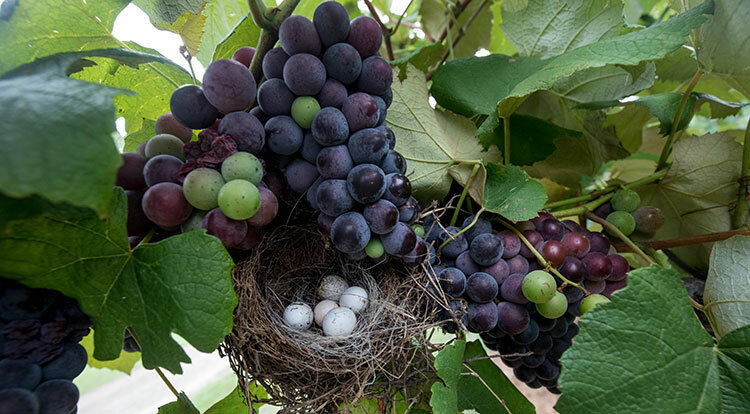 Popular wines include muscadine, Cynthiana, and Weinfest, which is a light white, fruity wine with a touch of sweet, says Dennis Wiederkehr, president and chairman of the board. He is the fourth generation of the Wiederkehr family to lead the operation, most recently taking over for his father, Al Wiederkehr, a true legend in Arkansas viticulture history. This historic cellar, made of native stone and mortar and filled with oak aging casks, is part of the tour of the Wiederkehr Wine Cellars. 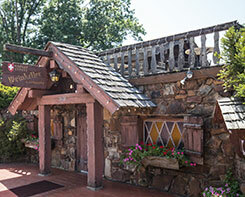 The Weinkeller Restaurant, listed on the National Register of Historic Places, serves traditional Swiss fare. Speaking of meals, be sure to stop at the Weinkeller Restaurant, which serves traditional Swiss fare and is listed on the National Register of Historic Places. It is housed in the original hand-dug wine cellar. A good time to visit Wiederkehr and other area wineries is Sept. 29 for the 55th annual Weinfest, a family-friendly festival that includes grape stomping, music, games and more. The Chateau Aux Arc Vineyards and Winery, 8045 Arkansas 186, Altus, specializes in wines made from the Cynthiana grape. “Cynthiana is the cabernet of the Ozarks,” says Audrey House, an owner and winemaker. The Dahlem Vineyard, 8411 Log Cabin Road, Altus, has table-grape vines dating back more than 35 years and also grows Cynthiana grapes. Also in Altus are the Dionysus Wine & Brew, 9017 Arkansas 186, a boutique winery, and the historic Mount Bethel Winery featuring specialty wines made from Arkansas-grown fruit such as blueberry and strawberry. And in nearby Wiederkehr Village is Neumeier Winery, 9023 Arkansas 186, known for its dry Muscadine wine. Just off the main drag in Eureka Springs, 3185 E. Van Buren St., is Keels Creek Winery, a boutique winery and art gallery housed in a Spanish-style building. Doug Hausler, a retired analytical chemist, and his wife, Edwige Denyszyn, an artist, started the winery in 2006. They grow grapes on eight acres outside Eureka Springs and source other Arkansas grapes. Also in Eureka Springs is Railway Winery and Vineyards, 4937 Arkansas 187, featuring artisan wines and local products including jellies, coffee and wine accessories. Another must-visit winery is Tontitown Winery, 335 N. Barrington Road, Tontitown, which has a rich history. Nazzareno Ranalli immigrated from Italy in 1907 and bought land that his grandsons continue to farm today, says great-granddaughter Heather Ranalli-Peachee. 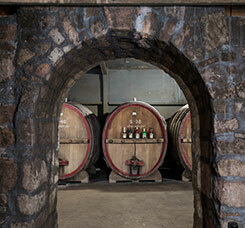 Members of the Ranalli family grew up making wine in their basement and decided to open a winery in 2010. It is housed in the Taldo House, circa 1917. “We were taught Italian-style wines and have a mix of sweet and dry. The Italian red is always our best seller. It’s a semi-dry, comparable to a Chianti so it’s wine to eat with, dry but not really dry,” Ranalli-Peachee says. Springdale is home to the Winery at Sassafras Springs Vineyard, 6461 E. Guy Terry Rd., which produces wines consiting of syrah, chardonnay, rosé and rielsling. The tasting room is located in what was once a milk barn. Dinner is available on Friday and Saturday evenings. Reservations are required. Set at the base of Mount Magazine, about 30 minutes from Altus, is Cowie Wine Cellars & Vineyard, 101 N. Carbon City Road, Paris. It houses the Arkansas Historic Wine Museum, which traces the evolution and development of the Arkansas wine industry. It is a must for any history buff. Museum admission is $5. The winery produces everything from dry to sweet, fruit varieties, and Robert’s Port, aged six years in oak, which has won more than 100 gold medals and is a multi-Grand Champion at the Arkansas State Fair, says Bob Cowie, owner of Cowie Wine Cellars in Paris, who has been crafting wine for nearly 60 years. Free tastings are offered. A great time to plan a trip is Sept. 8 for Trifest, which includes Arkansas Wine Heritage Day, the Arkansas Championship Grape Stomp and an amateur wine competition. There’s live music, grape-stomping, wine sampling, tours and fun galore. Southeast of Paris is Morrilton, which is home to the Movie House Winery, 99 Sandtown Rd. Founded in 2011 by Ken and Sherri Sowers, the winery has daily tastings Tuesday through Saturday. Located 20 miles west of Little Rock, An Enchanting Evening is a wonderful spot to sip a glass on the deck and soak up views of Pinnacle Mountain. Roger and Wendy Quaid own this venue, make wine from grape juice, and offer free tastings. They stock eight or nine varieties and are open Friday through Sunday. “We own a wedding venue, and the next addition was wine. My favorite is the Enchanting Red, a semi-sweet blend. After the tasting you can sit out on the back deck, bring your own picnic and enjoy the afternoon,” says Roger. Fruit wine lovers should head to River Bottom Winery at 13810 Combee Lane, Roland, to sample the best-selling peach wine. The family-owned operation crafts fruit wines with produce from their farm and brings in juice to make grape wine — those tend to be drier, says owner Karen Bradford. Wine tasting is free, and the winery is open Saturdays and Sundays. Enjoy a meat and cheese tray on the deck overlooking the river bottom. Visit during pumpkin season and you can pick your own pumpkins. 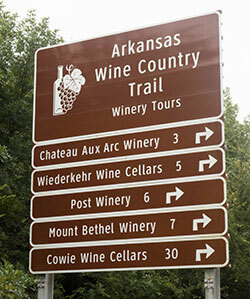 For more information about the Arkansas Wine Trail, visit: www.arkansas.com/articles/arkansas-wine-trail. Juliana Goodwin is a freelance writer specializing in food and travel. 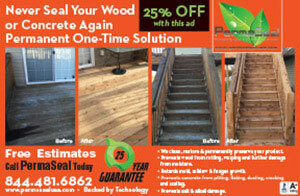 Sheila Yount also contributed to this article.